Rule Based « Global Market Insights, Inc. The competitive spectrum of cloud natural language processing market proudly boasts of some of most acclaimed top-shots, such as Amazon Web Services, Fuji Xerox, Baidu, Google, Netbase Solutions, IBM, Microsoft, Verint Systems, Apple Inc., SAP SE, Dolbey Systems, HPE, Facebook, and Nuance Communication. Given the distinguished stance these firms have in the tech cosmos, it comes as no surprise that these companies have been going the whole hog to bring forth a range of highly innovative products that would benefit the cloud NLP industry. The intensely fierce combative environment has made it even more mandatory for companies to adopt tried-and-tested as well as unique, out-of-the-box growth strategies to sustain in cloud NLP market. For instance, tech giant Google, in March this year, had announced the acquisition of Kaggle, a platform hosting machine learning and data science competitions. Through this takeover, Google plausibly aims to acquire one of the most active communities for data scientists, taking a step further toward establishing external integrations with its cloud platform and strengthening its position in cloud natural language processing market. It is prudent to mention that prior to this acquisition, Google and Kaggle had also joined forces to host a machine learning competition worth USD 100,000, revolving around YouTube video classification. It is thus undeniable that similar to Google, numerous other tech companies have been going the whole nine yards to exploit IoT and big data technology, both which work in tandem with NLP, the result of which would be explicitly visible from the commercialization potential of cloud NLP industry. 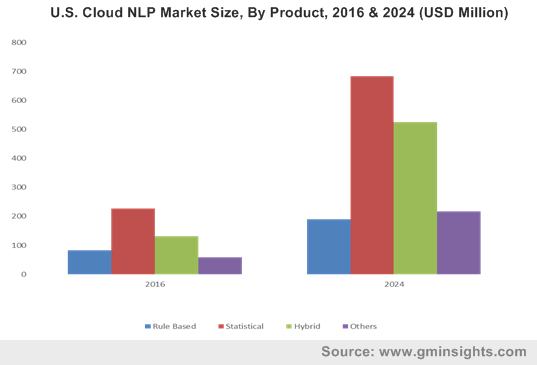 As per estimates, cloud natural language processing market size was pegged at USD 1.5 billion in 2016, primarily driven by the robust investments in artificial intelligence, that is deployed across a plethora of applications such as machine learning, advanced analytics, robotics, and more. 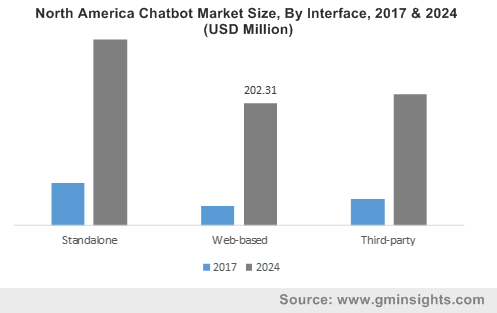 One of the most noteworthy instances that affirms the participation of tech giants in cloud NLP industry is the plethora of services that Amazon Web Services has announced to provide this year. Reportedly, the retail behemoth that holds a fair proportion of cloud natural language processing market share, has launched a wide-ranging series spanning 22 all-new services that comprise everything – right from data storage to analysis, and machine learning to convenient cloud transition. Amazon’s prodigious expertise in tapping the cloud, big data tech, IoT, and other innovations to make technology access convenient and flexible for software developers is indeed commendable. The e-commerce player, through this mega launch, has indeed consolidated its presence in numerous business verticals, cloud NLP industry being one of the most prominent ones. Furthermore, it is unquestionable that Amazon’s move would prompt dexterous rivals to break barriers and come up with intensely unique service portfolios of their own, which in consequence, would have a rather lucrative impact on cloud NLP market trends. As the resultant products and services would find pertinent utilization across myriad end-use sectors, such as the BFSI domain, for cross boarder payments, customer documentation, foreign exchange, customer voice processing, solving insurance queries, and text mining, cloud natural language processing market share would traverse a highly profitable growth path in the years ahead. The insights provided by Global Market Insights, Inc., with regards to the same, affirm the authenticity of the declaration – as per the firm’s analysis report, cloud natural language processing market size is likely to cross a valuation of USD 6 billion by 2024, making this business vertical one of most remunerative spaces for potential investors. As the elbowroom for technology transcends boundaries in the future, cloud natural language processing industry outlook is likely to witness a dynamic transformation, given the contribution of big data and IoT toward deriving powerful insights to ensure quicker decision-making in the fields of marketing, product management, competitive intelligence, etc. The robustly growing demand for content localization would also massively fuel the requirement of NLP services, thereby augmenting the revenue graph of cloud natural language processing industry. With major vendors attempting to launch extensively innovative products for a widespread application spectrum, and the increasing demand for ingenious analytics software that would command the deployment of the cloud space to derive business insights, cloud NLP market size is forecast to grow at an appreciable CAGR of 17% over 2017-2024, as per a report put together by Global Market Insights, Inc. This entry was posted in Sustainable & Smart Technologies and tagged Analytics, Cloud Natural Language Processing Market, Cloud Natural Language Processing Market Forecast, Cloud Natural Language Processing Market Growth, Cloud Natural Language Processing Market Research, Cloud NLP Market, Cloud NLP Market Size, Hybrid, Information Extraction, Machine Translation, Operational, Processing, Question Answering, Recognition, Rule Based, Statistical, Visualization.